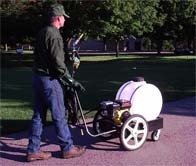 This 3 in 1 sprayer does it all, foliar tree applications, turf applications and sub-surface applications, all in an extremely effective, efficient and mobile package. The Trinity doesn’t require a trailer or truck bed for hauling. 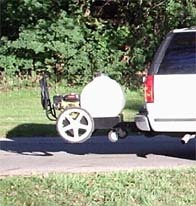 It can be used on or off the vehicle during application use and allows the applicator to use the truck bed for other equipment. Pressure range of 0 to 360 psi. This unit has been specially created for small localized treatments of products like tree growth regulators and for access to remote areas and rooftop gardens. 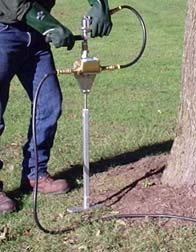 A lower pressure, battery-powered electric pump option is available for planting areas inside of buildings. The Multipurpose Probe is the best tool, as its name implies, for many types of applications; soil injection, foliar mist, turf spray, and a short tip probe for special hard-to-reach locations. The probe's design makes applications fast & easy and the Flowmeter makes it accurate. Sturdy construction will withstand years of constant use. A hard plastic, water-tight carrying case keeps your investment safe, while extending the life of your equipment.